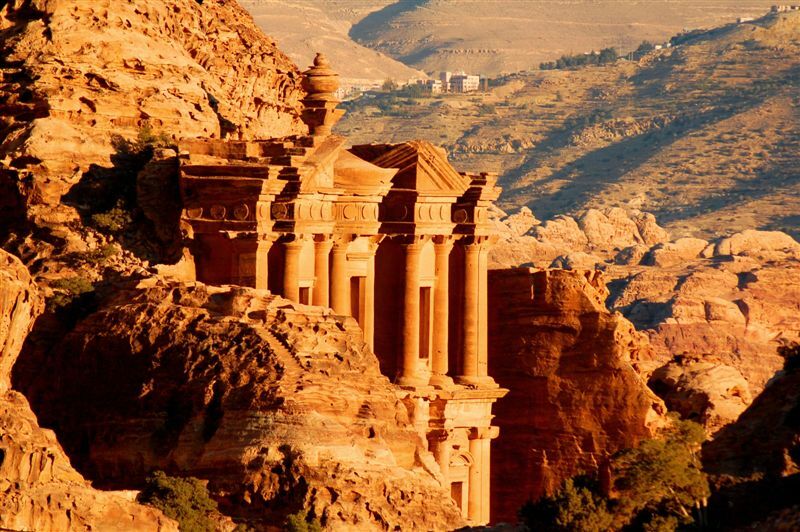 Petra is filled with infinite shapes and colors and there is a miraculous magical sacred quality in the interrelationship between its environment, the artistic genius of its Nabataean builders and the function of its structures. There are eight hundred tombs, many Djinn blocks (God blocks representing the deity) and a few freestanding structures, the largest of which is the Great Temple. Ed Eir monastery, one of the numerous Nabatean architectural masterpieces you can discover in Petra. This one is located on the far side of the place once you walked several kilometres in the dust and climbed the 850 steps carved in the red cliffs. I guess no one had never regretted the sweat to discover such a beautiful building. Erected sometimes in the IIth century BC by the Nabatean civilization, it is quite similar to the Kezneh I posted already. It is 43m high and 44m wide. Amazing place and excellent photo. Good colours. I congratulate. Nice historical building, good colours and compos, TFS. Beautiful capture of this most unique place Moncef! The strong sunlight is very powerful and dramatic. this Petra series are great. Love the light and composition. The strong colors loke great in such special place. Fantastic view, very sharp, with great colours and very well composed. Super b light and depht. It's a wonderful photo. Looks like when the sunsets on those architecture, it makes everything extremenly beautiful, showing off every little detail and shadows. I often think its a pity that the people that helped created these cannot see what monumental accomplishments they made to this world. An excellent picture of a place that I dreamed know personally. Amazing history captured here, textures and colours are warm too, nicely captured. It may need a little sharpening ? Fantastic perspective and beautiful light here Moncef. Such central placement of subject is perhaps a little amateurish, but the subject matter itself probably saves your shot in this instance. This is most impressive pov to show the 3-D face of the Temple basking in warm light to show sharp details and very well composed to show the other side of green spotted slope. Thank you for sharing my friend.. This is an outstanding POV with warm colours. Excellent shot Moncef! What a great place it is! Very well composed and a very nicely done composition, thanks!